Luc Van Hoorebeke set up his workshop for the production of artisanal pralines and other delicacies in 1982. He uses only the best Belgian chocolate and believes only in fresh ingredients. In the following years the recipes are made even more perfect and both the product range and the Van Hoorebeke family are expanded. 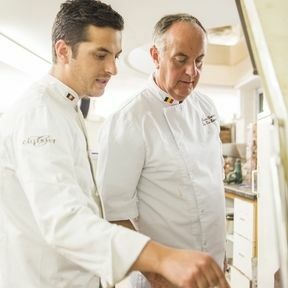 Son Cédric inherits his father's talent and soon they both share the same passion for chocolate. Cédric follows in his father's footsteps in 2008 and opens his own business. He enlarges and refines the variety even more and is open to innovations, without prejudicing the family tradition.